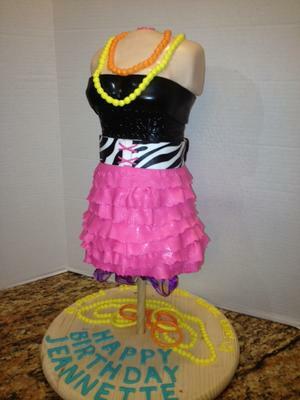 The bodice is rice krispy treats covered with fondant. Only the skirt is cake. The dowel is screwed into the base. I measured where I wanted the skirt to end up and secured a round disc of wood about an inch thick, like a donut. I then sent a screw right through the "donut" and dowel. Bam! a support. The skirt was on a cake board on top of another wooden plate so it would be supported well. I stacked (and supported) 4 layers of cake, buttercreamed them, covered them with fondant and then did the ruffles. It was very easy. I then placed the bodice on top of the cake and applied the bandeau. I made a wide belt to conceal the attachment. The beads and letters were made with a plain old Wilton Silicone form. This was for an 80's themed party at an actual disco. The outfit was made to replicate the birthday girl. just one word, AMAZING.I love it. Wow!! That is awesome. Fantastic job! !